On Monday the office of human rights attended the 30th Session of the Human Rights Council at the Palais des Nations in Geneva, where the annual report of the United Nations High Commissioner for Humans Rights and the Report of the office of the High Commissioner and the Secretary General were discussed. Present in the council were H.E. Mr. Mangala Samaraweera,Minister of Foreign Affairs, Sri Lanka, and H.E. Mr. Roberto Campa, Undersecretary for Human Rights, Ministry of the Interior, Mexico. The Council was inaugurated by a touching speech of the High Commissioner for Human Rights, Zeid Ra’ad Al Hussein, who called attention to all the devastating humanitarian crisis happening across the world, but specially the Syrian crisis. He mentioned the recent tragedy of Aylan Al Kurdi and reflected on what efforts is the world undertaking to solve this refugee crisis. Mr. Ra’ad Al Husseinimplored decision-makers in all continents to respect international human rights law, refugee law and humanitarian law, as well as to establish effective migration governance. As the resources available are not enough to cope with everything that is happening, he appealed to Member States to endorse OHCHR’s budget proposal of $198.7 million for the year 2016-2017. After the High Commissioner’s speech Mr. Mangala Samaraweera from Sri Lanka took the floor. He addressed the critics his country had received regarding human right violations and presented the measures taken: a Commission for Truth,Justice, Reconciliation and Non-recurrence, two offices of missing persons with experts from ICRC; to address the right to justice a judicial mechanism was proposed with a special council that states into account the rights of fair remedy and ends the problem of impunity. 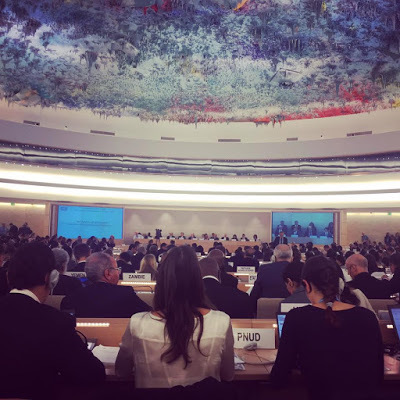 In order to accomplish all the remaining challenges Sri Lanka asks for financial, material and technical assistance, from the international parties including the OHCHR. Mr. Samaraweera ended his speech reiterating that even though his country had gone through difficult times, they are committed to not let this violations go unpunished, and to take preventive measures. In the same way H.E. Mr. Roberto Campa presented the action Mexico has taken to promote the freedom of media and the safety and protection of journalists. The State has been working along Freedom House to guarantee the protective measures and created the Prevention Unity. As to enforced disappearances, he said, Mexico presented an advance in the constitutional Reform of article 73, which enables the legislative power to create laws regarding forced disappearances and torture. The state is also committed to implement a national agenda. Mexico took the opportunity to call attention to death penalty and stated that forums, such as the Human Rights Council, should promote informed discussions ensuring that the states who still consider it moratory will abolish it at the end of the day. They also consider it necessary to promote cooperation in the assistance to nationals who have been sentenced to death abroad. Mexico supports the right of migrants regardless of their migration status and believes they are not only a national priority but rather an international one. The country supports gender equality so much so that Mexico recognized women and girls as development agents. The last item discussed in the day was the promotion and protection of all human rights: civil, political, economic, social and cultural rights, including the right to development. At the end of the sessions there was a general debate in wich Republic of Turkey, Syrian Arab Republic, Kingdom of Saudi Arabia, Democratic People’s Republic of Korea and Japan participated.